What is deep learning inference? We get a new image, perform ROI extraction with the trained CNN ROI generator and then perform defect detection with the trained CNN defect detector. Inference with a ML or DL model is a part of the production pipeline where a real-time or a batch data engineering pipeline processes an image and invoke the trained model to perform a prediction. The SLA to perform an inference could in split seconds or just a few milliseconds. We have experienced that the trained models we built for our discussed use case with Tensorflow keras/pytorch use to take more than 1 second to infer on a single image inserialized h5py format or .pt format in a standard CPU. But how do we infer in milliseconds ? Produce a valid Intermediate Representation: If this main conversion artifact is not valid, the Inference Engine cannot run. The primary responsibility of the Model optimizer is to produce the two files to form the Intermediate Representation. Produce an optimized Intermediate Representation: Pre-trained models contain layers that are important for training, such as the dropout layer. These layers are useless during inference and might increase the inference time. In many cases, these layers can be automatically removed from the resulting Intermediate Representation. However, if a group of layers can be represented as one mathematical operation, and thus as a single layer, the Model Optimizer recognizes such patterns and replaces these layers with one. The result is an Intermediate Representation that has fewer layers than the original model. This decreases the inference time. The Intel Movidius Neural Compute SDK comes with a Python API that enables applications that utilize accelerated Deep Neural networks via neural compute devices such as Intel Movidius Neural Compute Stick. The NCSDK requires a neural network graph file compiled with mvNCCompile NCSDK tool. Many network models from Tensorflow and Caffe are supported. The Graph class provides methods for utilizing the network graph. we can initialize the Graph with a name string. The name string can be anything we like up to mvncapi.MAX_NAME_SIZE characters, or just an empty string. Graph input and output is done with FIFO (first-in, first-out) queues. The Fifo class represents one of these queues and provides methods for managing it. We should create input and output Fifo queues for our Graph and allocate the graph to our device with Graph.allocate_with_fifos. We can omit the keyword parameters to use default Fifo settings or wecan specify other values as needed. If the input Fifo is full, this method call will block until there is room to write to the Fifo. FPGAs are silicon devices that can be programmed for workloads, such as data analytics, image inference, encryption, and compression. FPGAs enable the provisioning of a faster processing, more power efficient, and lower latency service maximizing compute capacity within the power, space, and cooling constraints of data centers. Standardization –The Intel Xeon CPU with FPGAs defines standardized interfaces that FPGA developers and development and operations teams can use to hot-swap accelerators and enable application portability. 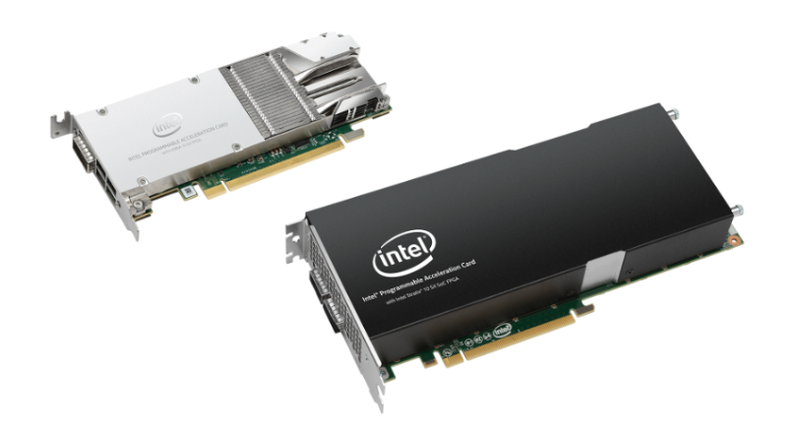 Accelerator Solutions — A portfolio of accelerator solutions developed by Intel and third-party technologists to expedite application development and deployment. Application that can benefit from FPGA acceleration range from streaming analytics, image inference etc. Make sure we have both the Jtag connection (through micro USB) and the PCIe connection. Rerun the environment setup script. 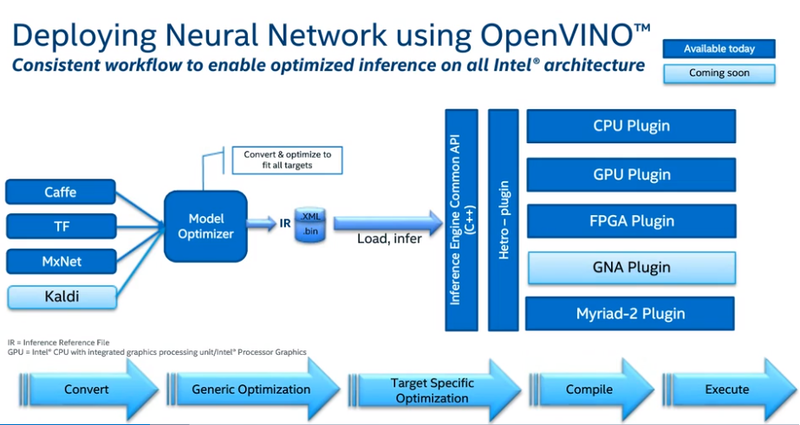 python3 /opt/intel/computer_vision_sdk/deployment_tools/model_optimizer/mo.py --input_model /home/<user>/openvino_models/FP32/classification/squeezenet/1.1/caffe/squeezenet1.1.caffemodel --data_type FP16 --output_dir . Note the CPU throughput in Frames Per Second (FPS). This tells us how quickly the inference is done on the hardware. Now lets run the inference using the FPGA.